Rio Tinto's (LON:RIO) and Chinese giant Chalco's plan for the massive Simandou iron ore development in Guinea calls for a 670km railway across the West African nation. In terms of costs and development time the route from Simandou in the south of the country to the northern port of Conakry, Guinea's capital, does not make sense. But the government of Guinea is betting that the railway will open up the impoverished country, already the world's number one exporter of aluminum raw material bauxite, for further development and economic growth. Rio has already spent $3 billion on development and apart from the costs added to the already expensive $20 billion project the route will have great social impact. The complex, 670km multi-user railway to take iron ore from the Simandou concessions, which Rio hopes it will start building in 2018, will include two viaducts, 24km of tunnels and 29 bridges, and is expected to help open up the heavily populated hinterland. The number of displaced people is larger than many were expecting, given the project's latest social and environmental impact statement says 15 settlements, with a total of just "270 structures", would need to be physically moved to make way for the railway. The statement said the rail corridor would occupy 8000 hectares of land and was expected to disrupt the livelihoods of a further number of households, resulting in more economic displacement. 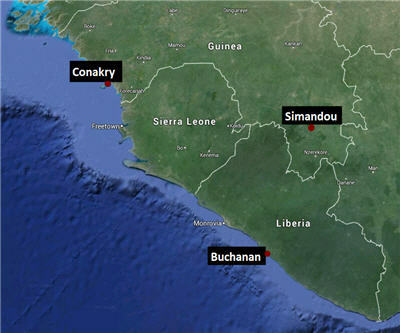 Guinea has the right to take up to 35% of Simandou and 51% of the proposed railway and port project. At full production Rio's Simandou mine would export up to 95 million tonnes per year – that's a third of Rio's total capacity at the moment – with a targeted commercial production date of late 2018. Guinea is home to some of the richest and easily exploitable iron ore fields outside of Australia's Pilbara region and a number of companies are setting up projects in West Africa. But other developers are choosing a different route to get the ore to market. Earlier this month London-listed Sable Mining was granted an export licence for its $250 million Nimba iron ore project in south-west Guinea via a railway through neighbouring Liberia to the port of Buchanan.